The Umbrella Academy is based on comic books created by none other than Gerard Way—former lead singer of the band My Chemical Romance. Beginning in 1989, the Netflix show begins with a peculiar case of 43 infants being born to women with no connection to each other, and with no previous signs of pregnancy prior to the births. A billionaire by the name of Sir Reginald Hargreeves attempts to adopt as many of these kids as he can, but only manages to adopt seven. Nonetheless, he creates a family of “superheroes,” raised as a team to eventually save the world. Once they are teenagers, however, the family falls apart. Yet now, in the present day, six of these estranged family members reunite once they receive news of their adoptive father Hargreeves’ passing. The seven siblings are known by their respective numbers, but they also have names and very different personalities. Their distinct characterization is apparent as soon as you meet them in the show. Completely and utterly different from one another, it is a surprise that they work as a team at all. Who they have become since birth is incredible, especially when compared to one another: the musician Vanya (Ellen Page), astronaut Luther (Tom Hopper), drug addict Klaus (Robert Sheehan), celebrity Allison (Emmy Raver-Lampman), and so on. The soundtrack of the show is diverse, from slow melancholy tracks suiting particularly eerie scenes, to bubbly pop sweetening the brighter scenes. 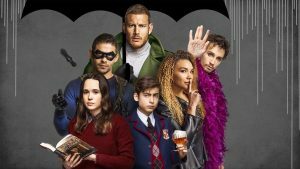 Unlike many shows, camera angles in The Umbrella Academy feel much more like those of a movie or delicate artistic video than of a TV series. Lighting is used gracefully, but not alone in its setting creation. Colours are cleverly chosen for setting the mood of scenes as well. Light exposure, shadows, and even effects such as bokeh are used in shots (“bokeh” being an effect where out-of-focus aspects of an image are softened and blurred for aesthetic purposes). All of these effects are consistent, among other techniques used, including the obvious diversity of camera distance shots. The outfits in this show are a force to be reckoned with on their own. Sir Reginald himself is a dapper dresser who even adorns a monocle. Because all the characters have such vastly differing personalities, their clothing choices reflect that. 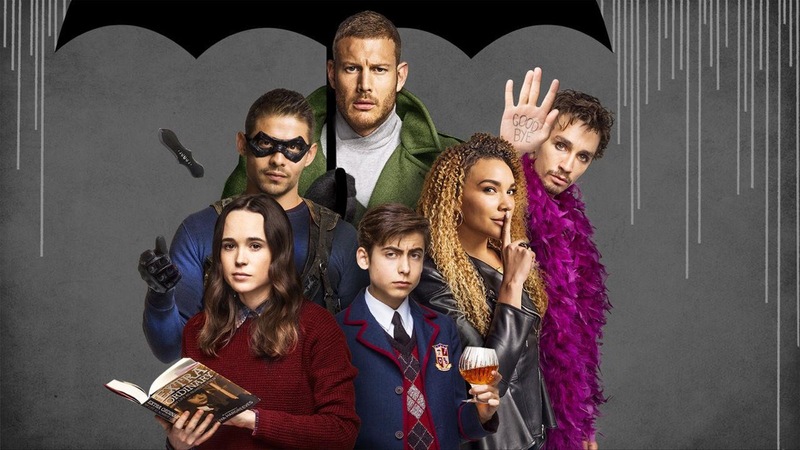 The Umbrella Academy has hour-long episodes, with 10 episodes currently out. It’s available to watch on Netflix—and I highly recommend it. The entire show is really a work of art.